It only took about 90 minutes to even the dirt, plant all the veggies, cage the tomatoes and water the new plantings. That’s a blog headline I never thought I’d be writing. Planting a garden in Wisconsin the past six years, March meant waiting for the snow to disappear and eagerly waiting to get into the garden to till the ground. And that rarely happened before the end of April. The last frost usually was around May 7, so other than lettuce, nothing got planted before mid-May. The 4-foot-by-16-foot bed full of dirt. One of the best things about moving to central Texas is the earlier growing season. 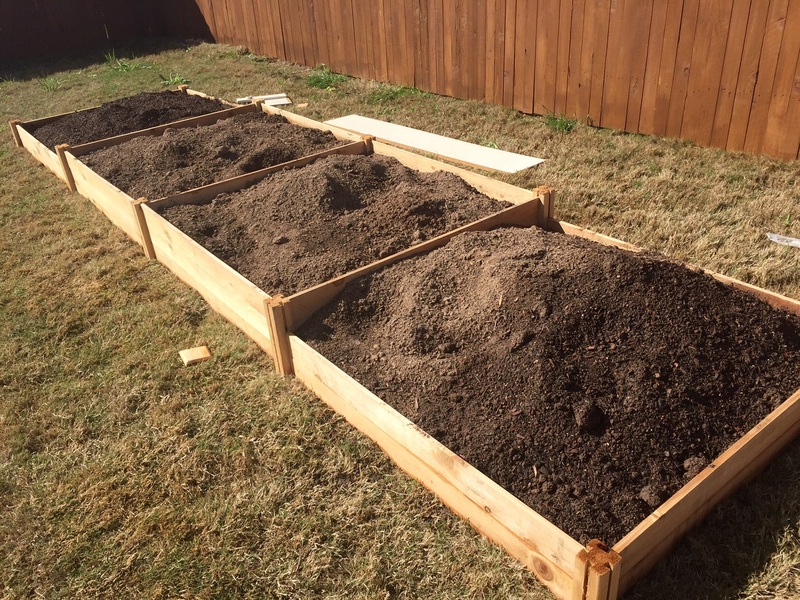 And after about 10 days of preparation (building raised beds and filling them with dirt), today – March 22 – was finally the day. 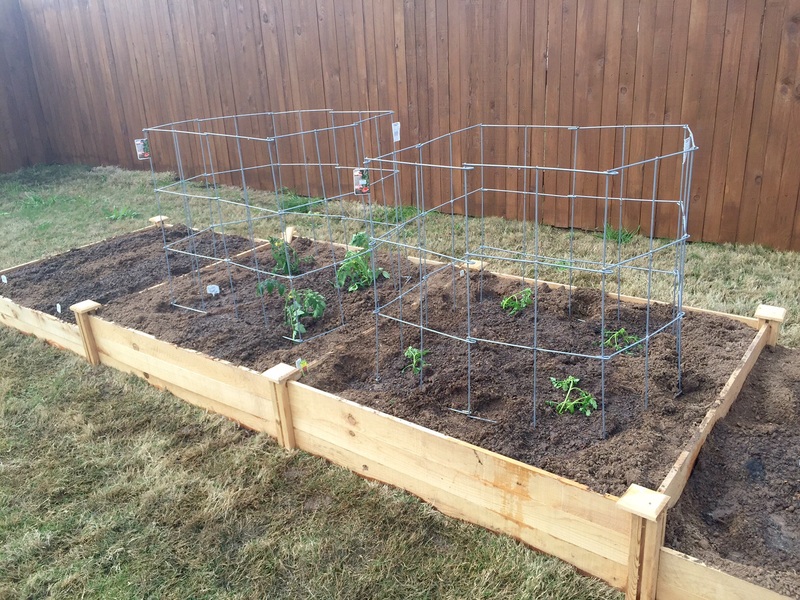 I planted my first garden in Texas. Granted, it’s nowhere near the size of my 30-foot-by-40-foot space in Wisconsin, but it’s a start. And I’ll let you in on a little secret. Planting any garden, big or small, feels great, at least to me. In addition to two Early Girl and one Better Boy tomato plants, I also planted a sweet red pepper. The tomatoes got planted first because they had been sitting in pots next to my house for several weeks. I used the two deeper beds in the middle for the four Super Sweet 100s, two Early Girls and one Better Boy. The four Super Sweet 100 plants need a little TLC after planting. I know that’s a lot of tomato plants for just me, but I couldn’t help it. Just like previous years, I intended to buy fewer plants this season. But I just can’t help myself when it actually comes to buying them from a local garden center. It always seems like seven is my minimum. That way, if they aren’t prolific producers, there are more plants to pick up the slack. And if they all produce a lot of tomatoes, my neighbors and co-workers will benefit from the overflow. This 4×4 bed has cucumbers, onions, chives and basil. On one side of the tomatoes, I planted the only other actual plants I bought, a clump each of basil and chives. I’ve never planted either before, so I have no clue how they’ll fare. Next to them I planted two hills of cucumbers and some red onions. I know it’s a gamble planting anything so close to cukes. The vines may overrun everything near them. I’ll have to watch and train the vines carefully in an effort to prevent that. Of couse, a thought just struck me. Maybe there’s a way I can use a trellis for the cuke vines and have the best of both worlds. Not quite sure how that will work, but at least I have some time to figure it out. This 4×4 bed has peas and beans. In the final 4×4 bed, I planted peas and beans. 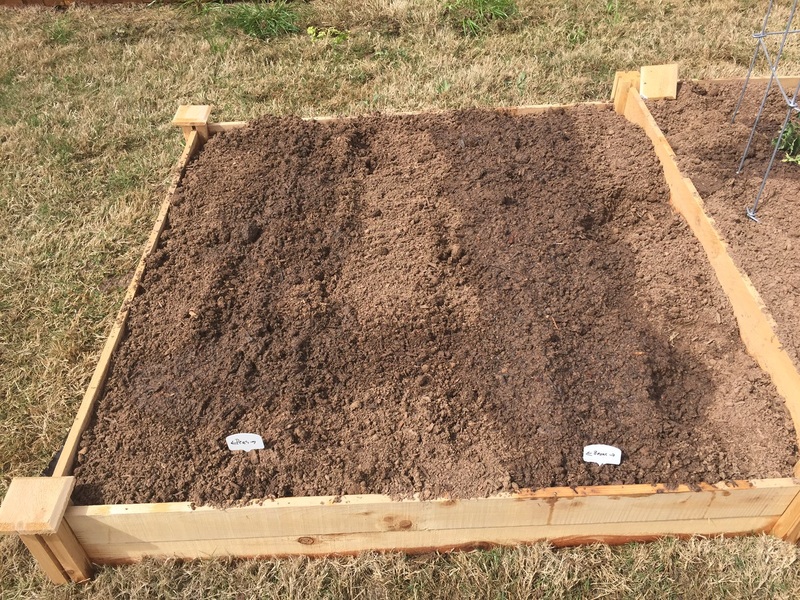 As you might be able to see by the watererd dirt in the picture, the rows of peas are close to each other as are the rows of beans, with a bogger space between the peas and beans. My intent there is to use some sort of trellis between the rows of peas and between the rows of beans. And who knows, maybe I’ll even try a second crop of peas in a couple weeks. 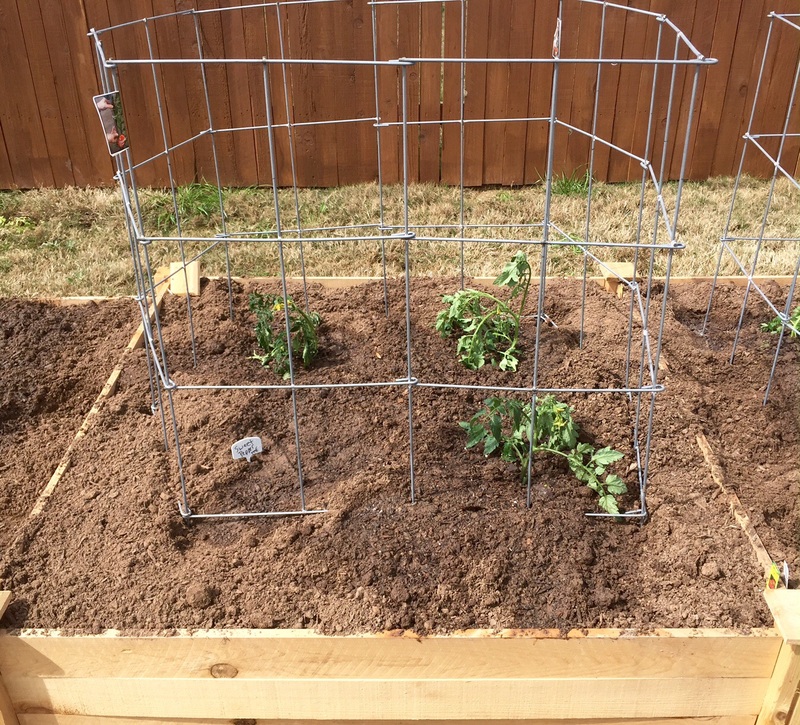 After I got all the plants and seeds in the ground, I put up the cages around the tomatoes and watered everything. The one nice thing about a small garden is that it takes a lot less time than a big one. I got everything done in less than 90 minutes, and that includes the cleanup. Next up: Planting flower seeds in my other raised bed. 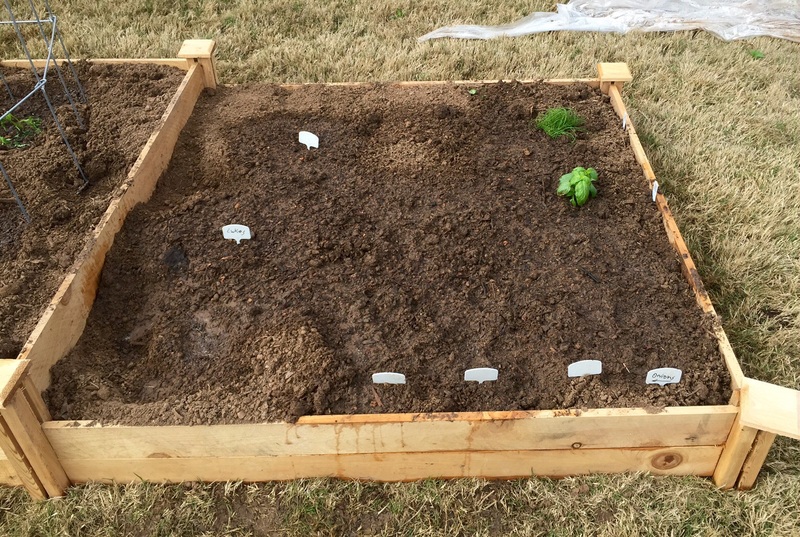 This entry was posted in Gardening and tagged basil, beans, chives, cucumbers, Garden, onions, peas, red pepper, tomatoes, Vegetables on March 22, 2015 by Julie Riebe. Thanks sweetpea! My fingers are crossed. Can’t wait to share photos when they bloom. And about the time that your garden is blooming, I’ll need a little virtual garden fix, as it will be way too hot here! Happy gardening to you, too. May is just around the corner! Julie, thank you for your return comments, and I look forward to seeing your next gardening post. Lovely garden beginnings, looking great too… Just wait in no time at all it will be all lush and green. 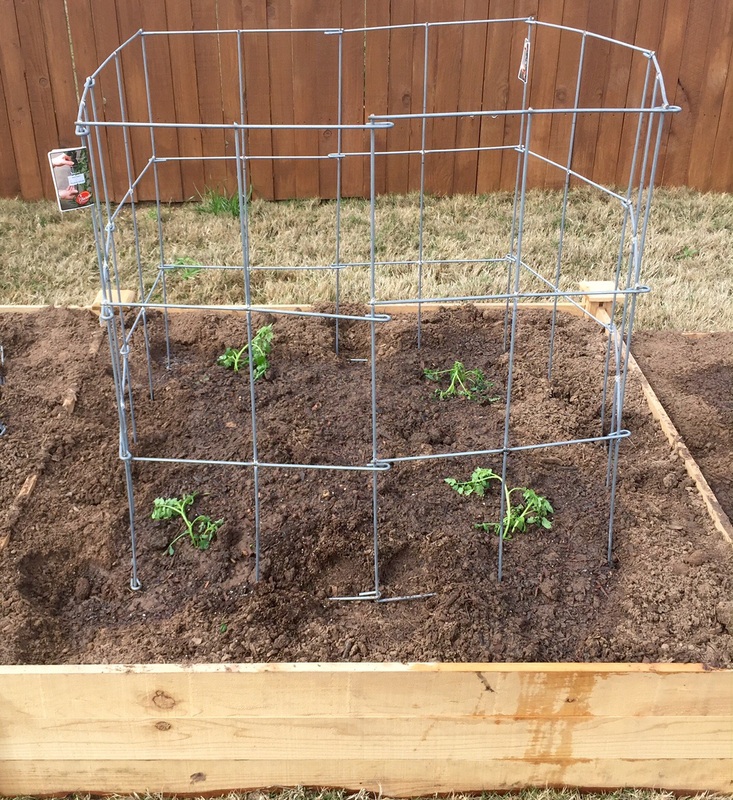 I’ve seen on other gardening post around ~ you can stake up your cucumbers or trellis them .. I’m also going to try that… they look so nice growing off the ground… Good luck there in Texas, I’m Jealous because it will me toward the end of May, before anything of mine heads outside to grow..